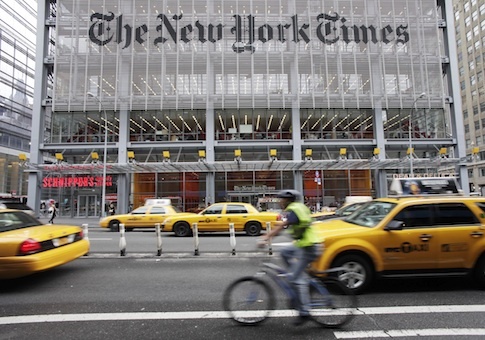 The public editor for the New York Times rebuked the paper on Tuesday for running an op-ed by a "Palestinian leader" while omitting his multiple terrorism convictions. On Monday, the Times online and international print editions ran a piece by Marwan Barghouti titled "Why We Are on Hunger Strike in Israel's Prisons." The Times initially only described Barghouti as a "Palestinian leader and parliamentarian." Missing from the op-ed and the Times byline was that Barghouti is in prison after being convicted of overseeing three terrorist attacks that killed five people, including a police officer and a Greek Orthodox priest. Barghouti was also convicted of masterminding a suicide bombing attack that backfired and only killed the bombers. In a statement, Israeli Deputy Foreign Minister Tzipi Hotovely castigated the paper. "Barghouti is not a prisoner," she said. "He is a convicted murderer and a terrorist. The New York Times has provided a platform to a terrorist without noting the fact that he planned and carried out the cold blooded murder of Jews simply for having been Jews." This article explained the writer's prison sentence but neglected to provide sufficient context by stating the offenses of which he was convicted. They were five counts of murder and membership in a terrorist organization. Mr. Barghouti declined to offer a defense at his trial and refused to recognize the Israeli court's jurisdiction and legitimacy. In a blog post the following day, the public editor for the Times, Liz Spayd, took the paper to task. "This isn't a new issue for the opinion section," she pointed out. "I have written before on the need to more fully identify the biography and credentials of authors, especially details that help people make judgments about the opinions they're reading." "Do the authors of the pieces have any conflicts of interest that could challenge their credibility? Are they who they say they are, and can editors vouch for their fidelity?" asked Spayd. The failure to identify Barghouti's crimes, she wrote, "risks the credibility of the author and the op-ed pages." This entry was posted in National Security and tagged Liz Spayd, New York Times. Bookmark the permalink.